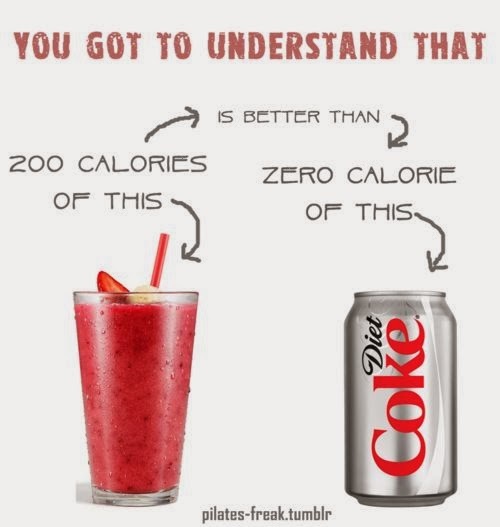 I have to admit I cringe deep down inside every time I see someone order a diet pop. I understand the addiction, I understand people think it’s “healthier”, I understand people think its a better option than regular pop.. but why? Can anyone straight out tell me why? Because there are no calories.. because there is no sugar? Think about what replaces that. A few years ago I completely gave up pop, juice, most alcohol and anything else you could think of other than coffee and water. I quit it cold turkey and though it was hard, I felt a lot better. Now I allow myself to have smoothies and juice every now and again because its a bit of a treat and it's a lot healthier and less addictive than pop. Drinking diet pop can cause kidney function to decline and eventually cause kidney disease (chronic kidney disease may develop complications like high blood pressure, anemia, weak bones, poor nutritional health, nerve damage and heart disease). These are just some of the side effects of DIET pop.. not pop all together. So if you think you’re saving calories by drinking diet, you’re likely to eat them later when you’re craving all kinds of sweet foods… or when your body just cannot metabolize sugar properly anymore. Our bodies cannot metabolize sucralose and when we continuously trick our bodies into THINKING that it is consuming sugar it will anticipate an energy boost and when it doesn’t come? You’re basically crying wolf and it would be really, really bad if your body stopped responding to actual sugar intake. People who drink diet pop and those who drink regular pop are just as likely to be obese. So kick the crap and DRINK WATER!